There are two methods to submit tickets to the helpdesk. The first method is submitting a ticket by email. 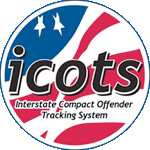 Instead of sending an email directly to one of the national office staff, you will send it to icots@interstatecompact.org. The second method is through submitting a web form on the helpdesk portal website. Once logged into the portal, you will click the ‘Submit a Request’ tab at the top of the page. On the next screen, fill out the web form as completely as possible then click ‘Submit’.